WEST LAFAYETTE, Ind. — A low-cost medication injection device company and a mobile forensics technology developer were the big winners Tuesday (Feb. 22) at Purdue University’s $100,000 Burton D. Morgan Business Plan Competition. LyoGo, formed by Rush Bartlett, Art Chlebowski and Peter Greco, took the $30,000 top prize in the Gold Division for graduate and undergraduate students and faculty. LyoGo has created a safe, one-step injection device that drastically reduces or eliminates the need for refrigeration of most therapies and can be used by any untrained individual. Battle Ground Technologies, led by Joshua Hall and Parker Woods, won the $20,000 first prize in the Black Division for undergraduate student teams. It is developing forensics products and computer services to market to military branches and law enforcement agencies. Finishing second and taking the $15,000 prize among the five teams in the Gold Division was Sorian, a company led by Matt Martin and Brady Kalb that is developing a technology designed to make wind turbines operate more efficiently. Graduate students Shaili Sharma and Randall Fees collected the $7,500 third prize for TeslaWeave, a company developing a material for treating tissue damage associated with osteoarthritis. VoCorDys and Tymora Analytical Operations received $3,750 each as finalists. In the Black Division, The LAKE Water Sports Complex, led by Chris Thoman, received the $10,000 prize as runner-up for its cable water park concept. RollOut Green, a floral garden arrangement firm led by Alvin Ang, David Barron, Ankit Gupta and Manaz Taleyarkhan, claimed the $5,000 third prize. GrowLite and WalkThrough won $2,500 each for presenting as finalists. Indianapolis-based law firm Ice Miller LLP will provide in-kind legal and consulting services valued at $5,000 to LyoGo, $3,000 for Sorian and $2,000 for TeslaWeave. The Purdue Research Park will offer incubator space to LyoGo and affiliate status to Sorian and TeslaWeave in the Gold Division. Battle Ground Technologies, LAKE Water Sports and RollOut of the Black Division also are eligible for Purdue Research Park affiliate status. A student on the top finishing team in each division also is eligible for a $5,000 annual Krannert scholarship to its full-time MBA program. The student must apply within five years and meet admissions requirements. In addition, category winners are eligible for a seat in Krannert’s two-week Applied Management Principles program, known as a mini-MBA, offered each May. Each team had 20 minutes for its presentation and 10 minutes for questions from the panel of 10 judges during the Discovery Park event, which was held in the Burton D. Morgan Center for Entrepreneurship. The competition process started last fall with 65 initial submissions. Sponsors for Tuesday’s event, which marked its 24th year, were the Burton D. Morgan Center for Entrepreneurship, Burton D. Morgan Foundation, Krannert School of Management, Ice Miller LLP and Purdue Research Park. 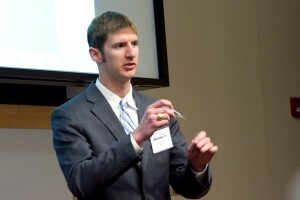 In 2010 Glytrix, which has developed a platform technology for tissue healing and regeneration that also minimizes scarring, won the $30,000 Gold Division. TerraSolutions LLC, the victor in last year’s Black Division, is developing a biodegradable, corklike material for flooring, insulation and other uses from the waste and byproducts of ethanol production. The Burton D. Morgan Foundation established the competition in 1987 with an endowment gift to Purdue, making it the nation’s third longest-running business plan competition. The Burton D. Morgan Foundation also funded the $7 million, 31,000-square-foot Burton D. Morgan Center for Entrepreneurship, the first building to open in Discovery Park in 2004.